You can support Cetos by giving and in return we will send you some fun products that display our logo. These products will let everyone know you care about marine research and you support it. 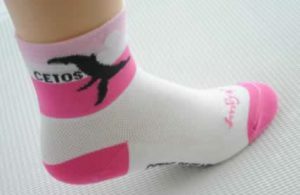 Our Cetos socks are fun to wear and great (also comfy) a thletic socks. Made of 100% cotton and inner looped padding. 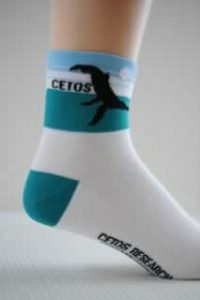 In exchange for a donation of $25.00 or more, we will send you a pair of Cetos socks. Great for Men, Women, and Children. S M L please specify with donation. Stickers for your car, boat, pelican case, snowboard, etc! They come in 3 sizes (L, M, S; 4.75″, 3.5″ or 2.5″ across). 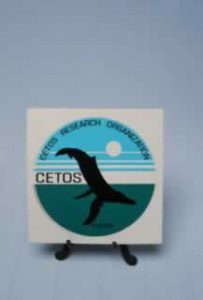 Cetos stickers are great for showing that you support whales and marine research. We will send you your size choice if you make a $20.00 or more donation. The stickers look great on a kayak, too.